eternal like the diamonds which encircle it. as it tenderly evokes infinite love every second of every day. To celebrate the time that this wonderful woman has shared with you, offer her the DELANCE “Infinity Gold link” watch that tells her, “I love you more than yesterday, but less than tomorrow”. 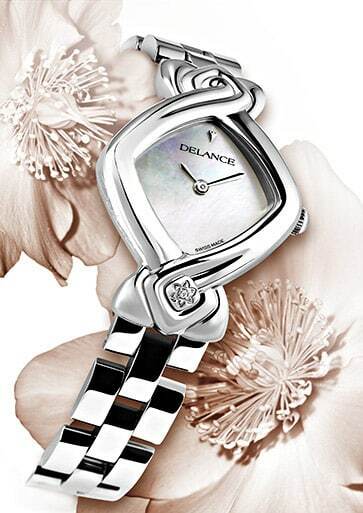 With 50 diamonds creating the sign of infinity the DELANCE “Infinity Steel Cascade” watch says “I will love you forever”, tenderly reminding you of your infinite love, every second of every day. With 50 diamonds creating the sign of infinity the DELANCE “Infinity Steel Aligator” watch says “I will love you forever”, tenderly reminding you of your infinite love, every second of every day. Set with 50 diamonds creating the sign of infinity, the watch says “I will love you forever”, tenderly reminding you of your infinite love, every second of every day. With 50 diamonds creating the sign of infinity, this DELANCE says, “I will love you forever” as it tenderly evokes infinite love every second of every day.